Przno is a small fishing village adapted into a touristic resort with a lovely sandy beach. Hotel “Maestral” is right alongside the beach. Pržno area is natural resort protected by the Government because of large number of old olive trees. Pržno is in the vicinity of Sveti Stefan. Together with its surroundings, Miločer and Sveti Stefan, it forms the elite and most well-known part of the Montenegro Adriatic sea tourist region – Budva riviera. 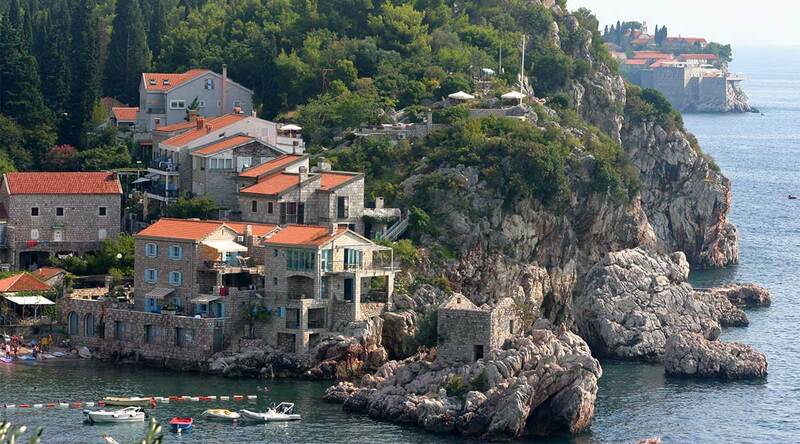 Budva riviera is famous for its lovely sandy beaches that are over 10 kilometer long. It has a mild Mediterranean climate with 220 sunny days in a year. Przno has got a sandy beach that is 260 meter long. Apartments Porat – This property is 1 minute walk from the beach. Set right next to the beach, Apartments Porat is quietly located 1.5 km from the centre of Sveti Stefan. It offers an on-site restaurant and a free WiFi. Housed in an authentic house overlooking the Adriatic Sea, some units feature air-conditioning and a cable TV. All units come with a private bathroom. Bed linens and towels are provided. Various bars, restaurants and shops can be found only steps away. A children’s playground, tennis courts, a spa and swimming pools can be found at a distance of 50 meter. The property can organise tours around Sveti Stefan, sightseeing of Budva’s Old Town as well as hiking and fishing trips. Facilities : Restaurant, Car hire, Airport shuttle (surcharge), Free Wifi, Free parking, Sea view.